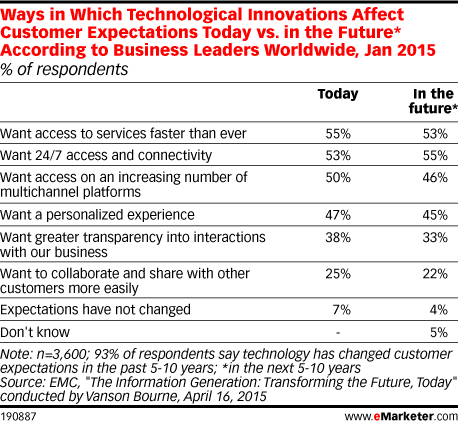 Data is from the April 2015 EMC report titled "The Information Generation: Transforming the Future, Today" conducted by Vanson Bourne. 3,600 business leaders from 18 countries worldwide across eight major industries were surveyed online during November 20, 2014-January 15, 2015. 50% of respondents worked for firms with between 250-1,000 employees, and 50% worked for firms with more than 1,000 employees. The margin of error is +/-1.7 percentage points.